South Gallia’s Emily Riggle (left), River Valley’s Grace Bays (center), and Ohio Valley Christian’s Amy Dong (right) compete in the 100m dash on Tuesday in Bidwell, Ohio. 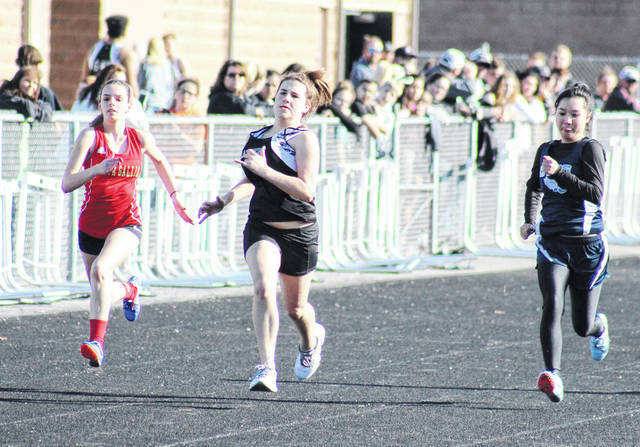 BIDWELL, Ohio — The Eastern girls track and field team bested four other local teams to capture the title in the 2019 River Valley Open, held on Tuesday in Gallia County. The Lady Eagles’ team total of 128 was 27 ahead of the Lady Raiders in second. The Southern girls squad placed third with an 81, while South Gallia and Ohio Valley Christian tied for fourth with eight apiece. The Lady Eagles were champion in four events, runner-up in 10, and third in five more. EHS was second in all-4 relays, with the 4x100m team of Jaymie Basham, Brielle Newland, Katlin Fick and Sydney Sanders posting a time of 56.79, the 4x200m team of Newland, Sanders, Basham or Alisa Ord recording a time of 2:00, the 4x400m quartet of Ally Durst, Rhiannon Morris, Ashton Guthrie and Whitney Durst coming in with a time of 5:03, and the 4x800m squad of Guthrie, Whitney Durst, Lexa Hayes and Alysa Howard finishing with a time of 11:48. Ally Durst won the 1600m run with a time of 6:04, 10 seconds ahead of Morris in second. Durst was also second in the 400m dash with a time of 1:13 for EHS. Fick was champion in the 100m hurdles for the Lady Eagles, setting a pace of 17.69. Ord won the long jump after a five-way tie-breaker at 13-7.5, while placing third in both the 100m hurdles and 300m hurdles with respective times of 18.76 and 55.61. Sanders was third in the long jump, also leaping 13-7.5. EHS sophomore Layna Catlett won the discus throw with a distance of 108-2, while placing second in the shot put at 32-6. Caterina Miecchi was third in the shot put at 29-6. Basham was second in both the 100m dash and 200m dash, posting respective times of 14.07 and 29.7. Newland placed third in the 200m dash with a time of 30.06. The Lady Raiders won eight events, including all-4 relays, while earning two second place finishes and five third place finishes. The RVHS relay team of Hina Horimoto, Lauren Twyman, Gabrielle Gibson and Savannah Reese paced 4x100m race with a time of 56.08, while winning the 4x200m with a time of 1:59.6. The quartet of Reese, Julia Nutter, Kate Nutter and Hannah Culpepper turned in a winning time of 4:55 in the 4x400m, while the 4x800m team of Culpepper, Twyman, Julia Nutter and Brooklin Clonch set the pace at 11:27. Twyman was first in the 100m dash with a time of 13.36, while Reese won the 200m dash with a time of 29.51 for River Valley. Kelsey Brown won the shot put for the hosts, covering a distance of 34-9, while claiming third in the discus at 85-7. Elisabeth Moffett was second in the discus with a distance of 92-9. Lady Raiders sophomore Taylor Huck was the pole vault champion, clearing 8-00. Huck also came up with a third place finish at 4-2 in the high jump. Culpepper was third in both the 800m run and 1600m run with a times of 2:45 and 6:39 respectively for RVHS. Southern won five events, claimed second in five more, while taking third twice. Sydney Roush was a two-event champion for the Purple and Gold, setting a pace of 2:40 in the 800m run, and a pace of 14:11 in the 3200m run. Mallory Johnson — who was second in the 800m run, just two seconds behind Roush — won the 400m dash with a time of 1:08, six second ahead of teammate Kelly Shaver in third. Kayla Evans was champion of the 300m hurdles with a time of 54.01, while Baylee Wolfe was second with a time of 55.45. Evans and Wolfe flipped places in the high jump, as Wolfe cleared 5-1 to win the event, and Evans cleared 4-10 for second. Evans was second in two more events for SHS, running the 100m hurdles in 18.11, and leaping 13-7.5 in the long jump. The Lady Tornadoes were third in the 4x200m relay with a time of 2:09.9 by the squad of Roush, Shaver, Peyton Anderson and Jacynda Glover. SGHS had one second place finish, with Jessica Luther running the 3200m in 15:16. The OVCS girls earned a pair of third place finishes, one relay and one individual. Leticia Araujo ran 100m dash in 14.09 for the Lady Defenders, while the 4x100m relay squad of Araujo, Laura Young, Chasity Deckard and Joicy Liao posted a time of 1:01.5.